To own your copy, click BUY MEDIEVAL, then follow the instructions on our partner website. Visit our Medieval Support page for downloads, rules updates, and / or to contact us about any questions or feedback you have. Wage war, unleash the plague, excommunicate the unworthy, and drive back the Mongol hordes. Medieval is a strategy board game designed for 2-6 players and plays in less than two hours. You are the head of a cabal—bent on controlling provinces, kingdoms, and of the Medieval world through skulduggery and outright conquest. The object? Spread your influence by controlling regions of Europe, the East, and North Africa—all while driving back the Mongol hordes. Your cabal pulls the strings. Great kingdoms unwittingly do your bidding—their wars, Crusades, and revolts, they’re all part of your plan. But you’re not alone in such dark designs. Other cabals wage shadow wars of their own. And against you. Armies and navies, assassinations and papal schemes, heretics and spies, are all at your disposal. And don't forget disasters. It's not game night without disasters! Provinces will fall, along with entire kingdoms, as a host of cabals vie for control of the medieval world. But there’s a dark and dusty cloud rolling in from the east—the Mongols. They’ll trample your holdings and leave them in ashes, removing them from the game. The player who survives the onslaughts of rivals and Mongols with the most province victory points wins. 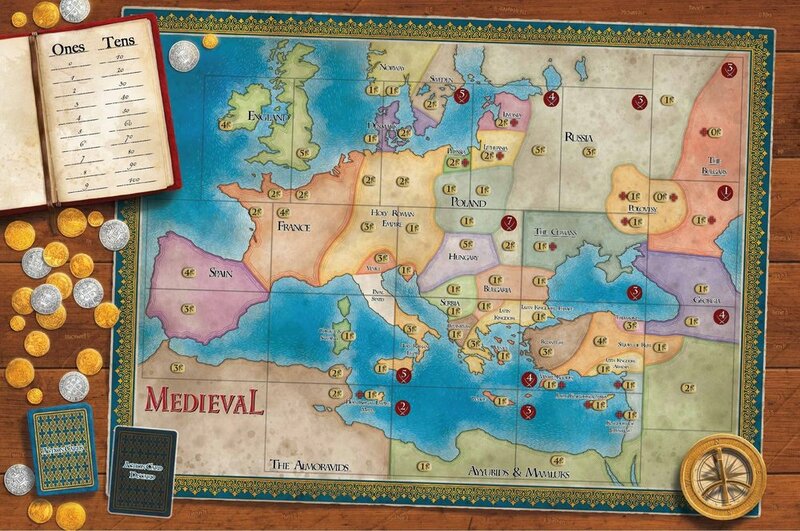 Fans of grand strategy games like Total War and Europa Universalis take note — Medieval might just be the board game you’ve been waiting for.